Haynesville Correctional Center is a level two facility that houses approximately 1,150 male offenders. The prison opened in 1993 and participates in the Virginia Correctional Enterprise program, employing inmates in clothing production. 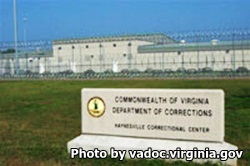 Haynesville Correctional Center also serves as a intake, reception and classification center, and is responsible for processing inmates into the Virginia Department of Corrections. During intake, inmates are assessed, a full criminal history is taken, and the inmate's custody level is determined. The offender is then assigned a permanent facility with programs and a security level that will best accommodate the inmate's rehabilitative needs. In order to qualify for Haynesville Correctional Center, offenders can have no escape history for at least five years. Inmates who have up to a single life sentence who are currently parole eligible can be at this facility. In order to qualify for a transfer to a lower security prison, offenders must have no disciplinary actions for at least 24 months. Visitation at Haynesville Correctional Center is based on the last digit of the inmate's ID number. Odd and even identification numbers will alternate days and rotate on a regular basis, because of this you will need to contact the facility by telephone to get the current schedule.